As we all have an idea about the Samsung Galaxy Note 2 hitting the shelves of the international markets and yeah, it was indeed impressive. Now, the Americans are eagerly waiting for the “phablet” to roll out across carriers. Not forgetting, Samsung also has an event slated one day before i.e., October 24th. 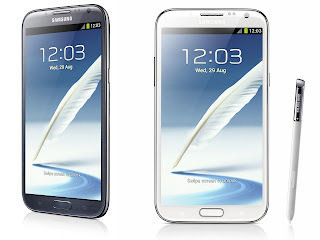 First thing you will notice about the Sprint variant of the Samsung Galaxy Note II is the huge HD Super AMOLED display occupying most of its front side. It measures 5.5-inches diagonally and has a resolution of 720 by 1280 pixels which may earn the device the tag of the “perfect phablet”. It is powered by a 1.6GHz quad-core processor, namely the Exynos 4412 by Samsung bundled with 2 GB of RAM. That is really impressive, right?? It will also have a 8 MP Camera on its back and a 1.9 MP Front facing Camera. An important feature to be noticed in the phone is that this smartphone is 4G LTE CAPABLE which undoubtedly makes the device one of the most powerful devices available in the U.S. The smartphone will also have a S Pen along with it and will feature the latest Android 4.1 Jelly Bean OS. Galaxy Note II will boast several firsts for Sprint - first to launch with Android 4.1.1, Jelly Bean; first smartphone display larger than 5 inches; and first device to launch with a quad-core processor"
The Sprint's version of the Samsung Galaxy Note II will come for $299.99 with a two year contract and Sprint will offer both white and gray versions. With Samsung slating an event on October 24th we also expect several other carriers offering the Note 2. 0 Respones to "Sprint Samsung Galaxy Note II arriving October 25 for $299.99"